Joyetech RFC Riftcore DUO Tank, which adopts innovative coil-free technology to create pure flavor and perfect cloud, is equipped with dual RFC heating elements with chipset to have faster heating speed. In addition, venting holes is helpful for adjusting temperature to make you have comfortable hand feelings. Joyetech RFC Riftcore DUO Tank, which adopts innovative coil-free technology to create pure flavor and perfect cloud, is equipped with dual RFC heating elements with chipset to have faster heating speed. In addition, venting holes is helpful for adjusting temperature to make you have comfortable hand feelings. What's more, special metallic materials makes one million puffs and it has self-cleaning function to save your time. You will enjoy the vaping experience with this atomizer. • Three-month warranty for Joyetech RFC Riftcore DUO Tank. 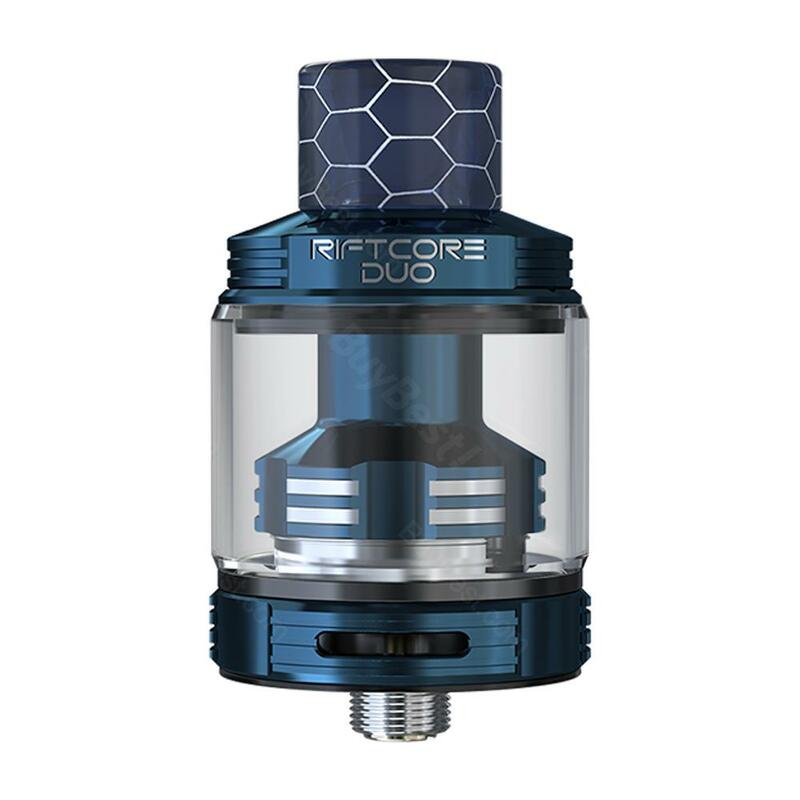 Now, if you are after low maintenance and cost efficient vaping and you are not concerned about flavour punch and intense vapour production…if you would just like a smooth, reliable tank that’s well put together, well then, the Riftcore Duo from Joyetech is a good option for you. See more Joyetech RFC Riftcore DUO Tank review. Gold Joyetech RFC Tank have fast heating,the top e-liquid filling is very convenient. Joyetech RFC Tank give me the pure flavor,fast delivery as expected, good quality and low price... i will order again at BuyBest. Bought a gold RFC Riftcore duo tank and received it in two weeks around. So far so good, only sometimes it gets hot. Expensive yet worthwhile, the joyetech tank comes out very pure and huge cloud. The airmail parcel arrived last week, in a safe condition. No breakage at all. My wife wanted one too when she used my duo tank once… So, here I ordered once again for her. As a fan of Joyetech, I was so excited about this Riftcore DUO tank when it's released. But the price is a little bit higher for me. Lucky me I find Buybest have it on sale and placed my order immediately. Happy shopping experience! I have bought some products from this site, trustful online seller. Can’t wait to offer a great compliment to the nice owner. Always so patient for my questions and so polite. Get touched by the kindest online owners of this world !!! And of course the quality of The Joytech tank needs no doubt. Just buy it, very nice price! There were a few issues among the shipping process, yet the customer services dealt with them quickly and in a satisfactory way. A trusted seller. Reuleaux RX GEN3 looks gorgeous and robust. It matches my wismec mod perfectly. Hope next time I could win one product from your giveaways. I often join and share your e cigs, plz choose me as a winner. Second to none tank. Joyetech is really the best and oldest brand in the field. Support it. Besides, the product in buybest is genuine, I have checked online. 3.5ml is suitable for my daily use. I just need to refill liquid once a day. Cool. 3.5ml Joyetech RFC Riftcore DUO Tank have a high quality,fast delivery and best delivery. Coil free design is interesting. Have been using it for couple of days, performance is as good as it should be. Decent flavor and vapor. Would recommend the RFC tank to any vapers who don't like bother building their own coils. Отличный бачок с низкой ценой!